Enter the length of the fish in inches and the girth of the fish in inches to get the approximate pounds for that fish. using the techniques that our customers prefer. Our Charter Captains and Guides offer a variety of boats which are well-suited to various fishing techniques. Many of the techniques offered can be used to target several different species simply by making a few minor adjustments. Alternately, a single species can be targeted with multiple techniques, giving anglers the option to catch fish the way they choose. Below is a brief rundown of the tactics that Sport Fish Michigan's Captains and Guides use. These tactics break down into 2 basic categories-non-trolling and trolling. 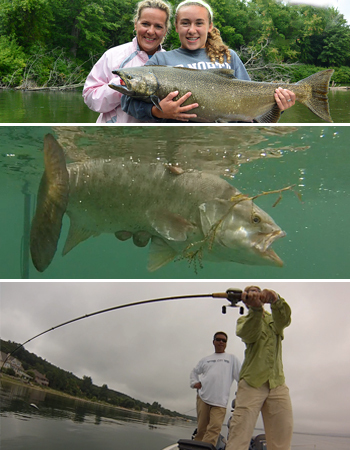 Non-trolling tactics are hands-on for the angler-the angler makes each presentation with rod in hand. Trolling is less hands-on for anglers until a fish is hooked. Boats used for trolling are typically larger than those for non-trolling. Both tactics are fun, productive, and have their time and place based on our customers' preferences. Sport Fish Michigan is happy to make recommendations based upon an angler's experience level, goals for their trip, and their fishing style of preference. The boat travels at a set, slow speed covering massive amounts of water. Several rods are set out in a spread pattern with various lures to cover different depths within the water column. Trolling is not a technique that lends itself to every type of water. For Sport Fish Michigan, trolling is often a big water tactic, used on Lake Michigan and Grand Traverse Bays, fishing for king and coho salmon, lake trout, steelhead, brown trout, and walleye. Trolling is a terrific way to efficiently cover a lot of water. Each angler is allowed up to 3 rods, creating the opportunity for multiple presentations running through the water column at the same time. Trolling does not involve a hands-on casting technique-once the baits and/or lures are in the water, anglers troll to and through the fish, waiting for bites. By covering a large area of water trolling, this tactic allows the lures to be pulled through potentially greater numbers of fish, seeking out, and hopefully appealing to, actively feeding fish. This is a fun and relaxed way to enjoy a day on the water. It's also a great way to introduce new anglers to the sport of fishing. Sport Fish Michigan Captains do the hard work of setting the rods and lure spreads while the customers enjoy the fun of reeling in the fish! Trolling can have many subtle nuances which often mean the difference between getting bites and not getting bites. Our Captains have the knowledge to make the fine-tuning adjustments to their boat and lures to maximize opportunities. Boats used for trolling by Sport Fish Michigan Captains are larger than those used for other fishing tactics, allowing them to fish the bigger waters of Lake Michigan and Grand Traverse Bays in style and comfort. A larger boat also allows each Captain to take up to 6 people onboard. 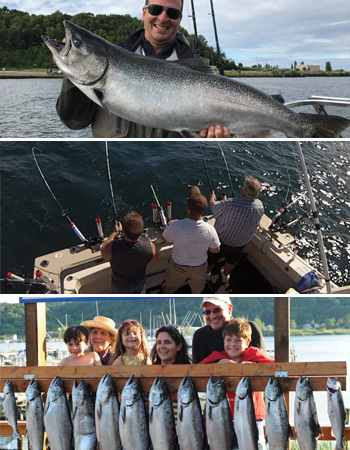 Many families enjoy taking advantage of this opportunity to take the entire family fishing. These boats also typically have a restroom aboard, making them more "female friendly." Sport Fish Michigan caters to many types of groups. Larger groups, like corporate outings, are made possible by using multiple boats. Wedding, bachelor, and bachelorette parties on board our boats are a terrifically fun way to spend time together while sharing an activity that everybody can enjoy. Casting is a 100% hands-on technique for our Sport Fish Michigan customers. The basic premise of casting is to use a rod and reel to propel (cast) a bait or artificial lure away from the angler, then retrieving it by winding the fishing line in with a reel. Because each customer makes their own casts and presentations, they are able to feel or watch bites, and then get the thrill of reeling in the fish. This is an exciting way to catch fish! Adding to the excitement is that the fight is much closer to the boat, because of casting distance, making it likely that an angler gets to see the fish run, jump and pull once hooked. With such clear water in Michigan, we can enjoy the watching the fight underwater quite easily. Sport Fish Michigan Guides are excellent teachers, and provide all of the tackle and gear necessary for a fun day on the water. Whether using spinning rods or bait casting gear, casting is a fun and productive way to fish for just about every species that Michigan has to offer. Each species requires the use of slightly different techniques within the basic premise of casting. Gear also varies greatly from species to species. What works well for smallmouth bass on Grand Traverse Bays or Lake St. Clair may not be the best option for targeting large king salmon on the Big Manistee River or brook trout on a small creek. Successful casting is a true example of using the right tool for the job. Rods, lines, and even the size of reel vary, creating the best opportunities for anglers to hook, and hopefully boat their species of choice. Each Sport Fish Michigan Guide is well-versed in the best options available. Boats used for casting techniques are typically smaller than those used by the Sport Fish Michigan Captains who troll. This allows for smaller fishing parties-1-3 anglers. Because each angler makes his or her own cast and presentation, smaller parties per boat are necessary. Smaller boats allow for casting techniques to be applied on many different bodies of water. From a bass boat fishing Grand Traverse Bays and Lake St. Clair, to a river jet sled or drift boat on the Manistee or Betsie Rivers, boats play a large role in which casting techniques are utilized. The smaller nature of these boats allow for greater all-around access to various types of water, and lend themselves to fish casting techniques extremely well. They are also very stable platforms from which to fish. Just like the larger boats used for trolling, each boat carries the required safety equipment and is MDNR inspected where necessary. 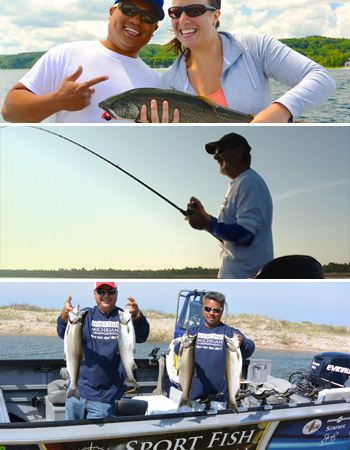 Similarly, all of the Sport Fish Michigan Captains and Guides are licensed and insured. Fishing may be what we love to do, but safety is our number one priority for all trips. Vertical jigging is a technique that has been around for a long time, but is growing in popularity. It is also 100% hands-on for customers. Similar to casting, Sport Fish Michigan Captains and Guides use spinning or bait casting gear for their customers. Vertical jigging is an angling technique in which the bait or presentation is directly vertical to the boat. Baits or lures are lifted and dropped, mimicking a wounded baitfish, goby, or other prey along the bottom. This is an effective technique when fishing water ranging from 20 feet deep to depths of 120 feet or more! Vertical jigging techniques allow an angler to fish anywhere in the water column, making this an incredibly effective technique for fish suspending at specific depths in the water column, as well as fish hugging the bottom. Species that are susceptible to vertical jigging presentations also vary. Walleye jigging on the Detroit River is very popular in the spring, and is one of the best techniques for landing these tasty fish. Slight alterations can be made for jigging walleyes on inland Michigan lakes, as well. Lake trout, king and coho salmon, and whitefish are also prime targets for vertical jigging presentations on waters such as Grand Traverse Bays, Platte Bay, and other Lake Michigan waters depending on the time of year. Even Muskies can be jigged vertically in the St. Clair River as well as the Detroit River, lending to some amazingly vicious strikes from these toothy battlers. Similar to casting techniques, gear used for vertical jigging varies, and there is a right tool for the job. Part of the addictive fun of vertical jigging is anticipation. Use of a sonar graph is very often crucial to success. Both individual fish and schools of fish are located through the use of these sonar units. Once located, jigs, jigging spoons, or other presentations in use are dropped to the proper depth. It is very common to spot a school of fish on the sonar graph, watch it react to the jigging motion, and then experience the thrill of an aggressive bite on the end of a line. Similar to video game fishing, this is a new experience for many anglers, and one that makes this style of fishing addicting in nature. Being able to predict bites based on what the Sport Fish Michigan Captains and Guide see on their sonar is incredible! This is an amazingly productive technique, and one that can be enjoyed by anglers of all experience levels. Michigan is home to world-class fly fishing water. Fly fishing differs from conventional tackle presentations: a long, limber fly rod moves to propel a fly line that pulls a very light-weight fly towards its goal, whereas in a conventional tackle presentation, the weight of the lure is what pulls the line. A very heavily weighted fly weighs a mere 3 grams. Gear presentations, by contrast, are 5-6 grams at their lightest. Fly fishing is not just a sport where small, delicate flies are presented on top of the water to rising trout in a small stream. Those familiar with fly fishing know that this is only a small portion of the sport, and that it's possible to fly fish for big species such as sharks, sailfish, pike, muskies, and salmon. In some situations, fly fishing can be a much more productive technique than conventional tackle. Fly fishing also does not need to be overly complicated to be enjoyed. Sport Fish Michigan's fly fishing Guides are also outstanding instructors, able to bring enjoyment to those who have never fly fished before. Classes and personal instruction are also offered by some of the Guides. Fly fishing has its own techniques and nuances that make it as varied as conventional tackle fishing. Different types of flies, lines, and rods are all used to create a huge variety of presentation techniques. Sport Fish Michigan fly fishing Guides are well-versed in these different techniques, and knowledgeable about their effectiveness on the species targeted. With few exceptions, just about any species that can be caught on conventional tackle can also be targeted on fly. 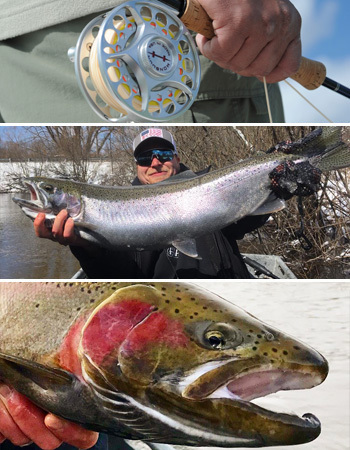 King and coho salmon, lake trout, steelhead, brown trout, brook and rainbow trout, smallmouth and largemouth bass, pike, muskies, and other species have all been guided for by Sport Fish Michigan's excellent fly fishing Guides. While typical fly fishing mindsets involve fishing in streams and rivers, Sport Fish Michigan's fly fishing Guides also guide on waters such as inland lakes, Grand Traverse Bays, Platte Bay in the Sleeping Bear Dunes National Lakeshore, and even on Lake Michigan. Big water can be successfully fished with fly fishing techniques, and having the right Guide will put you in contact with the best opportunities. Some of the common guide trips for Sport Fish Michigan fly fishing guides are those for king salmon, coho salmon, smallmouth bass, carp, steelhead and of course rainbow, brown and brook trout.